There are many default receipt templates included with the Evergreen staff client. These templates are saved on individual workstations. Customization can be done workstation by workstation or by exporting the templates to import to other workstations. All receipts in Evergreen follow a basic format of a Header, Line item and Footer. The receipt templates follow full W3C html. http://w3schools.com/html/default.asp. The Editor can also be found on the default home page of the staff client. Receipts come in various types: Bills, checkout, items, holds, transits and Payments. Select Admin → Workstation Administration → Receipt Template Editor. Choose the Receipt in the drop down list. Make edits to the Receipt on the right hand side. Click out of the section you are editing to see what your changes will look right on the Left hand side. Click 'Save Locally' in the Upper right hand corner. Receipt templates use macros for various pieces of information coming from the Evergreen database. Macros deal with everything from the Library name to the due date of an item. See list Receipt Macros for the macros. You can also click on MACROS on the screen to see the macros that are available for a given receipt. Remember: Not all Macros listed on the pop up screen will work. The listing of macros are drawn from the table that the receipt pulls information from. Some of the tables will not have any data in some of the fields. Example is the %mbts_xact_finish% on the Bills Current Slip, as this is a list of current bills, they would not have a finish date. Once you have your receipts set up on one machine you can export your receipts, and then load them on to another machine. Just remember to 'Save Locally' once you import the receipts on the new machine. Select the location to save the template to, name the template, and click Save. Navigate to and select the template that you want to import. Click Open. Customizing the receipts is fairly simple once you realize what can be placed in each of the sections of the receipts. One thing to remember when customizing receipts to always 'Save Locally'. Checkouts, Hold Slip, Hold Transit Slip are customized below. Always remember to 'Save Locally'. Click Admin → Workstation Administration → Receipt Template Editor. 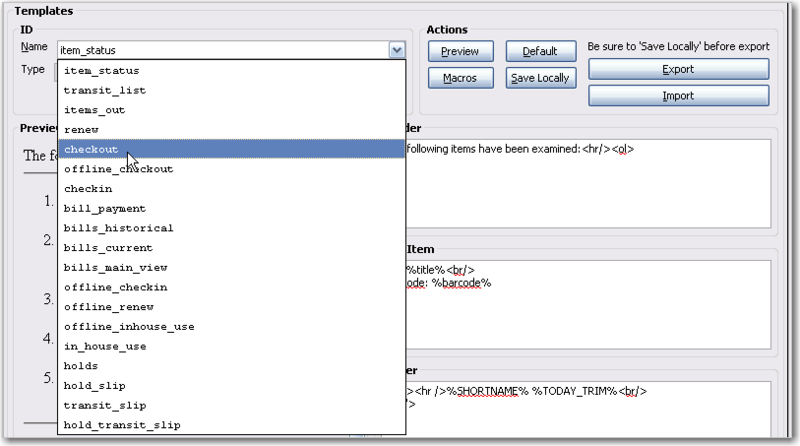 Select hold transit slip from the Template Name drop down menu. Enter <div> before and after the block of text that you wish to rotate. When you click out of this box, notice that the text in the Preview box on the left side of the screen has rotated 90 degrees. You can further customize the look of the text by adjusting its height and width. The height and width that you specify will be unique to your printer. This is the receipt that prints when items are checked out to individuals. Item you can customize are adding the library logo, adding information about renewals on the bottom of the receipt. If you notice at the end of the Footer the <br/>.<br/>, the allows an auto cut printer a little extra room so it will not cut the phone number off. The period is needed so the extra lines are added. This is the slip that prints when a hold is fulfilled. Things to customize are the patrons name at the top of the slip, Bold the %hold_for_msg%, among others. This is the slip that prints when a hold is fulfilled. This slip uses the SUBSTR macro to truncate the Patrons Last name to the first 4 characters and the patron’s barcode to the last 5 digits. This slip is designed for libraries that use self-serve holds. So, you will notice a lot of information about the hold is left off of the receipt. 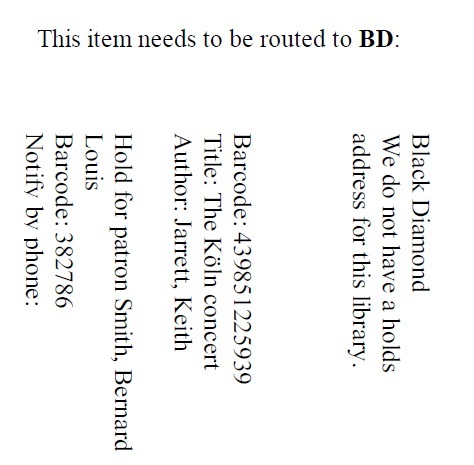 This is the slip that is printed when an Item is needed at another library for a hold. In this customization, the address of the library is removed, The library’s shortname size is increased, and made a little more notable at top, and the patron’s phone number and email address is removed from the slip. This is a complete list of all the receipts currently in use in Evergreen. Listing of items inputted in to Item Status. List of items in transit. List of items a patron has checked out. List of items currently checked out to the patron during this transaction. List of items checked out via the Standalone interface. Remember that Standalone interface does not have access to the database. List of items that have just been entered in to the check-in screens. Listing of bills that have had payments made on them. This is used on the Bill History Transaction screen. Listing of current bills for a patron. List of item checked in via Standalone interface. Remember that Standalone interface does not have access to the database. List of items renewed via Standalone interface. Remember that Standalone interface does not have access to the database. List of item marked in-house use via Standalone interface. Remember that Standalone interface does not have access to the database. List of items inputted in to the In-house use. List of items on hold for a patron. This list is used to print the holds on a title record. This list is used to print the holds on a patron record. This list is used to print the holds on the holds shelf. This list is used to print the holds on the holds pull list. This is printed when a hold is fulfilled. This is printed when a item goes into transit. This is printed when a hold goes in-transit to another library. This is printed from holding maintenance. Here is a list of the Receipt Template Macros that are in use on the receipts. There are two types of macros General and type specific. General Macros can be used on any of the receipts. Type specific macros are available depending on the type of the receipt. Take substring starting at position # to end of string. If # is negative count backwards from end of string. Same as %SUBSTR(#)%, but limit to second provided number characters after start point. If second number is negative, count backwards instead of forwards. 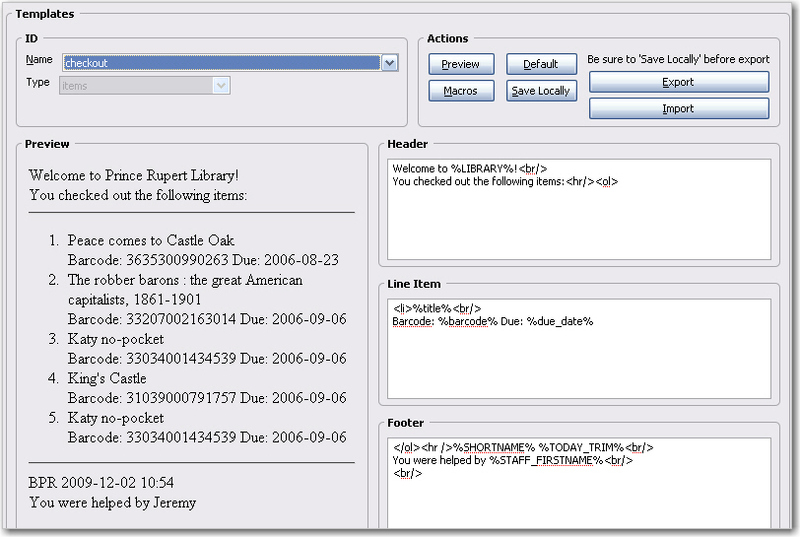 There are several macros that can carry pre-built contents specific to individual libraries. The contents can be set up in local administration. For details see Library Settings. Though text can be hard-coded in receipt templates, the pre-built contents will be automatically applied to receipts printed from all workstations without editing each template. Phone number listed in the Hold Database. This may not be the same as what is in the Patron’s record, as they can list another number when placing the hold. The date that the Request was originally placed. Title that the payment was applied to. Transit receipts come into two types, general Transit receipts and Transit slips. Transit receipts are listings of item that are in transits. Transit slips are Slips telling the staff that this item is in transit to another location. Library that placed the item intransit. Library Street address Line 1 that the item is in transit to. Library Street address Line 2 that the item is in transit to. City, State, Zip of Library the Item is in transit to.